At least three robbers, armed with rods and a strong sedative, struck at a house in Block-D of Bhai Randhir Singh Nagar, murdered a middle-aged woman, injured her husband and decamped with jewellery and cash worth thousands of rupees early this morning. 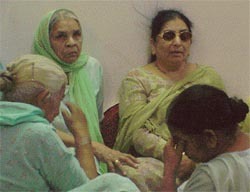 The elite ladies club in the city, Laxmi Ladies Club, charged with unlawful and forcible possession of around 3,000 sq yards of government land, adjoining the official residence of the Commissioner, Municipal Corporation, in the posh area of Rakh Bagh in the city, is facing the threat of eviction. It was a lifetime experience for at least 180 employees of Ludhiana district who had gone on poll duty in the trouble-torn state of Jammu and Kashmir. Even though they lived under the shadow of death for 12 days, they were mesmerised by the beauty of the valley. More than 50 jhuggis and other temporary structures near Haibowal Dairy Complex on Rajpura Road were removed by the demolition squad of the Municipal Corporation (MC) here today. The team of officials also cleared some other encroachments in Bhai Randhir Singh Nagar locality. 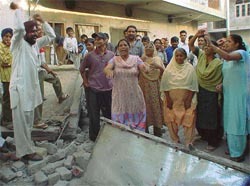 Tension gripped Sunet village adjoining Bhai Randhir Singh Nagar this evening after a team of the Municipal Corporation along with some activists of a local Tarksheel Society demolished some rooms and a religious place constructed illegally on an encroached land. One group of residents was in favour of the demolition while another one was against it. Harassment of the general public at the hands of staff employed by octroi contractors is going on unabated ever since the privatisation of octroi collection by the municipal council around two months ago. The large turnout at a camp organised by the District Agriculture Department to promote contract farming in the district is an indicator of the willingness of the farmers to diversify and quit the wheat-paddy cycle. As many 200 farmers filled contract forms to sow mustard and winter maize in place of wheat on a part of their land. An emergency meeting of M.Phil and Ph.D school teachers was held under the leadership of Ms Kanwal Jit Kaur Bal, president of the Ph.D and M.Phil Teachers’ Association, recently. The teachers expressed their concern over the stepmotherly treatment being given to them. Mr V.B. Handa, Sessions Judge, Ludhiana, has acquitted Didar Singh of Machhiwara from the charge of murdering his wife, Manjit Kaur, maintaining that the prosecution had failed to prove its case.